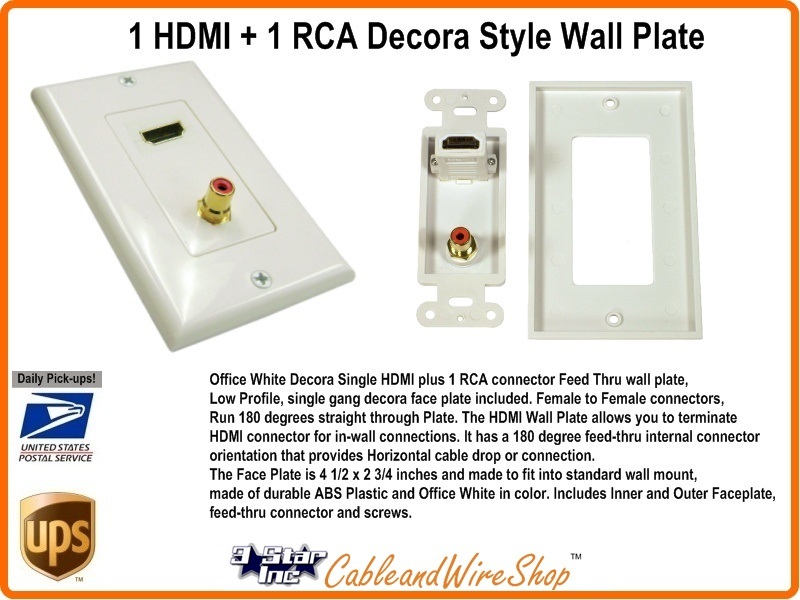 Office White Decora 1 HDMI plus 1 RCA connector Feed Thru wall plate, Low Profile, single gang decora face plate included. Female to Female connectors, Run 180 degrees straight through Plate. The HDMI Wall Plate allows you to terminate HDMI connector for in-wall connections. It has a 180 degree feed-thru internal connector orientation that provides Horizontal cable drop or connection. The Face Plate is 4 1/2 x 2 3/4 inches and made to fit into standard wall mount, made of durable ABS Plastic and Office White in color. Includes Inner and Outer Faceplate, feed-thru connector and screws.